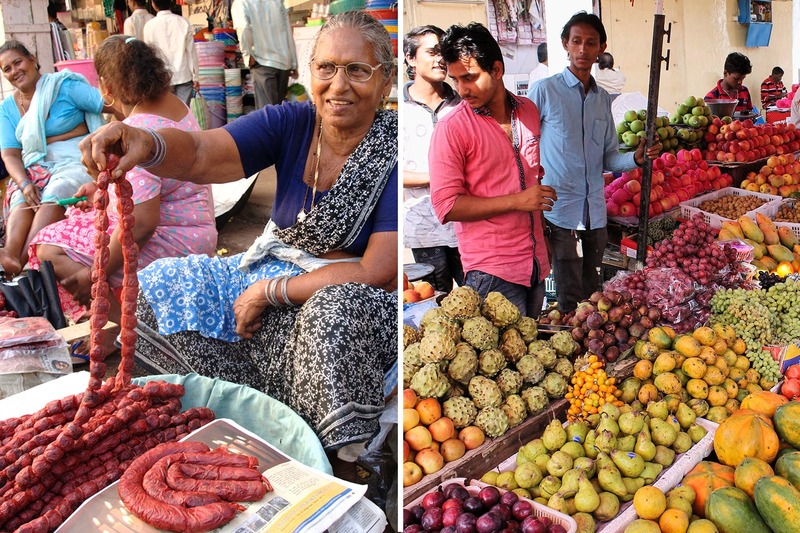 Mapusa market has always been one of the main centres for trading and shopping in Goa from the olden times. In fact, they say that the market grew to become so significant, that the town that developed around it was derived from the business conducted at the market. The Konkani words, “map” (meaning to measure) and “sa” (meaning to fill up) are joined to form the word Mapusa. It is a vibrant and bustling market that is open from around 9am till 6.30 – 7.00pm, Monday to Saturday. Like most Goan markets, it tends to shut down for the traditional susegad or siesta time in the afternoons. One can find just about anything at Mapusa Market, with items ranging from antiques and Goan pottery to handicrafts, textiles, clothing, spices, fruits, vegetables, meats, jewellery. Bargaining is advised, and is a good place to test your haggling skills. Also, most shops now accept cards but usually for a minimal billing of INR 200 to INR 500 but the local street vendors only accept cash. There are ATMs in the vicinity of the market, so you don’t need to worry much. There are buses that run in to Mapusa from just about everywhere in Goa, for as cheap as INR 10-20 a ticket. Mapusa is a great place to meet the locals, take pictures or just walk about. But on Friday, the Market gets super active and busy, and we suggest you get there then for the best experience. On every Friday, local traders, farmers, artisans, etc. showcase their produce or works. And that’s the day you will also get the opportunity to buy without paying middleman prices. It is a great place to find fresh local food products like pickles, dried fish, Goan chorizo & spiced and marinated pork sausages. Desserts like dodol, bebinca, cashew nuts, seedless tamarind (amot), etc. Visit the fish market as they have lovely local fish available, that one does not usually get to see outside of Goa such as Chonak, Modso, etc. A great place to look for bargains on hand-woven kunbi sarees, towels, pottery and antique items. Find yourself eyeing the lovely ashtrays and candle stands in hotels? This is where you can find them. Go and look for the 90-something-year-old seller, Romaldine D’Sa and listen to her life and love story. Though not required to anymore, she still comes and sells her wares at the market. She turned 90 last year and has not missed one market day for the last five years. She sits near the fruit market, and just loves meeting her regular customers and friends or make new ones. Go to the bar overlooking the market called ‘The Pub’. Don’t let the dingy flight of stairs deter you. The place is buzzing and just what one needs after the shopping. One can sit with a chilled beer and take a break and just watch the hustle and bustle of the market. The food is pretty good and is totally value for money. Their crispy fried sardines are a house specialty. After you have sampled the local shopping, head on to the street out side Alankar Movie Theatre, which I call the Goan Khau Gully. This whole street comes alive in the evenings, with various food stalls making everything from Chinese, tandoori and Goan delicacies to fresh juices & milkshakes. The portions are very large and prices are very cheap, and one can even pack food for your midnight snacking. Go in the first half of the day to catch the early worms.